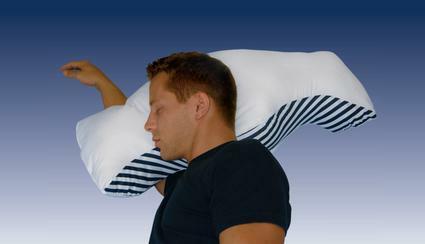 If you suffer from sleep apnea or your partner complains of your snoring, the SONA pillow may be a solution for you. LoveToKnow had the opportunity to speak with Art Perry, president of Soft-Tex, to find out more about how the pillow works and what's next for the SONA line. LoveToKnow (LTK): What went into creating the SONA Pillow? How was it tested and perfected over time before its release? Art Perry (AP): The SONA Pillow was invented by Harvard-educated neurologist Dr. Najeeb Zuberi after 10 years of laboratory research and product development. Zuberi wanted to help his patients who suffered from sleep apnea, a serious condition that causes people to stop breathing temporarily and can be fatal. Zuberi designed the pillow to assist patients who were diagnosed with mild sleep apnea and/ or snore by helping promote a more natural and comfortable sleeping position. The pillow repositions the jaw and assists in the opening of your airway to help you breathe more freely, which helps you get a more restorative night's rest. LTK: How does it work? AP: The SONA Pillow's unique design promotes a comfortable side sleeping position. In this posture, the specially designed slope of the pillow repositions the jaw to optimally align this, creating a more natural and open airway, letting the user breathe more freely. Contoured arm openings along with a special back support piece in the pillow help maintain the side sleeping position throughout the night. LTK: Can anyone use it or is it exclusively for people who snore or have sleep apnea? AP: Anyone can actually use the SONA Pillow and in fact, many people who do not snore or suffer from sleep apnea use it simply to help them a get a better, more restorative night's sleep. LTK: How is using the SONA pillow different from sleeping on your side using a regular pillow? AP: When you are asleep on your side with a regular pillow, you can very easily move from sleeping on your side to sleeping on your back, a position which collapses the airway and can produce snoring and/or negatively impact a person with sleep apnea. Ordinary pillows also do nothing to assist with opening up your airways and some traditional bed pillows actually collapse your airway, which may make your condition worse. LTK: What is the adaptation period usually like? How long do customers tend to take to feel very comfortable sleeping on the pillow? AP: Because of the unique design of this pillow, some users experience slight discomfort during the first few nights of use. For people who primarily sleep on their back, it may take longer to adapt to the position. However, within 30 days most users report that they are not only sleeping more sound and more comfortably, but their sleep partners are also getting a more restorative and better night's sleep. LTK: Do you have any tips for back sleepers who have trouble sleeping on their sides? AP: If you have trouble sleeping on your side it could be due to a number of factors. Sleeping on a mattress that is too firm can cause pressure points on the shoulders or hips, which can be uncomfortable or, in some cases, painful. A softer mattress or the addition of a soft mattress topper may help. I would also suggest trying a specialty pillow made to encourage side sleeping. For example, the new Side Sleeper Pillow, part of SONA's new Sleep Styles pillow line, was developed in conjunction with a sleep lab to ensure the maximum comfort for side sleeping. This can be used to get back sleepers more accustomed to side-sleeping, before using the SONA Pillow. LTK: For sleep apnea sufferers, is there an immediate improvement in their sleep and how alert and refreshed they feel the next day? What kind of results should customers expect right off the bat? AP: Yes, in fact users have reported experiencing an improvement from the very first night they try it. In a medical study, researchers observed an average decrease from 17 snoring episodes an hour to less than five. As a rule, however, we emphasize the importance of using the pillow for at least 30 nights which allows the body to learn and adapt to the new position, before you begin to feel its benefits. LTK: What are the dangers of leaving sleep apnea untreated? Is the pillow enough for most mild cases of sleep apnea? AP: Many sleep apnea patients report health, social and professional problems associated with lack of sleep and/or exhaustion. But feeling tired and lackluster is not the only medical concern; there are many primary health concerns associated with sleep apnea. The traumatic sleep apnea episodes negatively affect the heart which is why many individuals who suffer have a higher risk of cardiovascular disease, stroke, high blood pressure and arrhythmias. Sleep apnea can also cause sleep deprivation which many believe is a leading cause of auto-related accidents. Even if you are not diagnosed with sleep apnea, mild and chronic snoring can be equally harmful to you and certainly detrimental to your sleeping partner's health. While most people don't think of snoring as problematic, it affects millions of Americans, especially people who are overweight or over 50 years of age. The SONA Pillow can help those with either mild cases of sleep apnea or mild and chronic snoring. However, it is recommended that you see your physician and/or visit a sleep clinic that specializes in sleep disorders if you feel you have a more serious sleep related condition. LTK: In addition to using the SONA Pillow, what else can people who suffer from snoring or sleep apnea do to alleviate their condition? AP: My first recommendation is to see your neurologist or a sleep specialist. After you have been properly diagnosed you can then address your specific problem. If you are diagnosed with severe sleep apnea you may be required to use a CPAP (Continues Positive Airway Pressure) device. This machine opens up the person's airway during sleep by a constant flow of pressurized air into the throat. This prescribed treatment is generally preferred over a more invasive surgical treatment, which may or may not be covered by insurance. Regardless, seeing your physician is key. LTK: How do you care for the pillow/pillowcase? AP: The pillow may be spot cleaned, while the pillow cases are machine washable and dryer safe. LTK: How often does the pillow need to be replaced? AP: Without specific knowledge of how often the pillow is being used and or the size of the individual using the pillow, the doctor recommends replacing the SONA Pillow every two years. LTK: What's next for the SONA line? AP: Building on the success of the SONA Pillow, we have developed a full line of specialty pillows that allow you to sleep in your favorite position more comfortably. The new Sleep Styles line, available in stores this summer, consists of a Back Sleeper, a Stomach Sleeper and a Side Sleeper pillow, which have been tested in Dr. Zuberi's sleep laboratory for maximum support and comfort for each of these sleep positions. We have also developed a uniquely shaped Spinal Support Pillow, which provides lower back support and reduced shoulder stress while you sleep. This pillow is ideal for pregnant women or anyone who wants to help alleviate lower back pain as they sleep. The pillows run from $49 for a pair to $59 for the Spinal Support Pillow. I received a SONA Pillow thinking that my husband, who snores, would be able to use it. After four nights, he decided that he could no longer use the pillow simply because he cannot sleep comfortably on his side. The nights that he did use it, I thought the snoring episodes were less frequent. However, due to the brief trial, I can't say for certain that the pillow was able to stop his snoring. Curious and still hoping for a more thorough review, I tried the contoured pillow. I normally sleep either on my side or my stomach and found the pillow extremely comfortable-more comfortable than the regular pillows that I had been sleeping on. It is a perfect middle-ground when it comes to firm vs. soft, flat vs. fluffy. It feels sturdy under my head and doesn't strain my neck. I have given up my regular pillows in lieu of the SONA. Unfortunately, since I don't snore or have sleep apnea, I can't evaluate the effectiveness of the pillow from that perspective over a long period of time. I do believe that the SONA Pillow could be beneficial for those who snore as long as they are not completely averse to sleeping on their sides. I would recommend it to anyone who can sleep on their side (even if they have a slight preference for back-sleeping). The SONA Pillow was provided for review.